1: The steel stem is of small diameter so as to keep the alloy steerer tube of sufficient thickness. 2: replacement bulb kept in the handlebar plug. 3: moyne freewheel removal tool with alloy handle. 4: the colomb bell also contains the headlight switch. 5: the taillight is protected rather effectively. 6: the cyclo derailleur is equipped with a control cable on an eccentric lever, ensuring equal spring tension in all gears. 7: to follow the regultions, the headlight had to be protected : here is what they arrived at. 8: protection of the taillight : the attachment screw of the cover is a wingnut. the wire is evident on the outside. 9: it was necessary to modify this mafac lever to attach the cable with a screw. 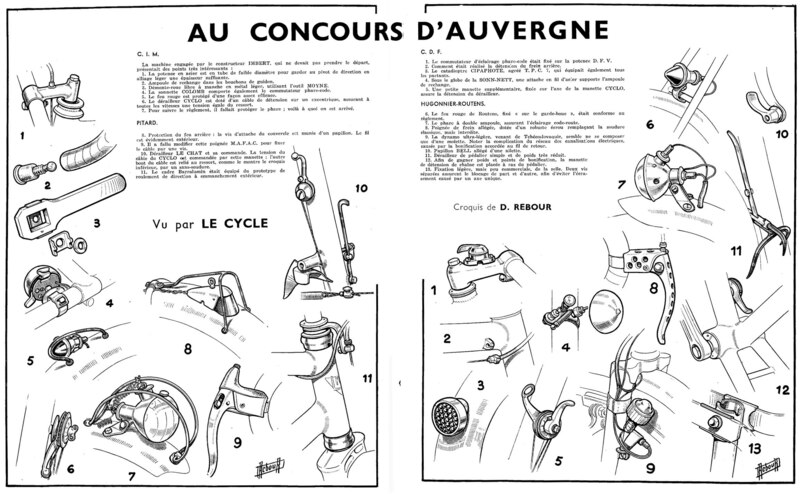 10: le chat derailleur and its lever. the cable tension of the cyclo is controlled by this lever : the other end of the cable is connection to a spring, as shown in the lower drawing, by a pinch bolt. 11: the barralumin frame is equpped with a prototype externally jointed / coupled headset. 1: the lighting switch is mounted on the d.f.v. stem. 2: the mechanism for slackening off the rear brake cable. 3: the cipaphote reflector, which equipped all bikes. 4: under the dome of the sonn-nett, a steel wire supports a spare bulb. 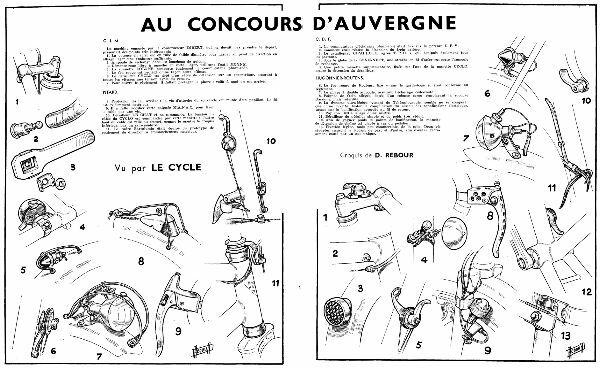 5: a small supplementary lever, mounted on the pivot of the cyclo lever, assures derailleur tension. 6: the taillight of routens, fixed to the mudguard, conforms to regulations. 7: the two buld headlight assures lighting in accordance with the highway code. 8: light brake lever, with a sturdy nut replacing the traditional, but prohibited, welding. 9: the ultralight dynamo, from czechoslovakia, seems to be composed only of one serrated roller. note the complicated wiring, because of the improvements made to the return wiring system. 10: bell wingnut, reduced to one wing. 11: simple front derailleur of very reduced weight. 12: in order to win pounds and bonus points, the chain tension lever is mounted quite close to the cranks. 13: light, but not very commercial, attachment of the sadde. two separate screws ensure fixation on either side, in order to avoid the crushing which would be caused by a single bolt.